Managing multiple WordPress sites can be frustrating and time consuming. Unless you are hosted with a managed WordPress hosting provider like WPEngine, keeping all of your WordPress site up to date becomes your responsibility. Sometimes, one missed WordPress update is all it takes for hackers to potentially ruin all of our hard work. Wouldn’t it be nice if there was a single dashboard that lets you easily update plugins, write new posts, monitor for traffic and downtime, check your analytics, do SEO analysis on posts, create backups, and much more without logging into each site individually? If you like the sound of it, then you will really love this article. In this article, we will show you how to efficiently manage multiple WordPress sites using ManageWP. 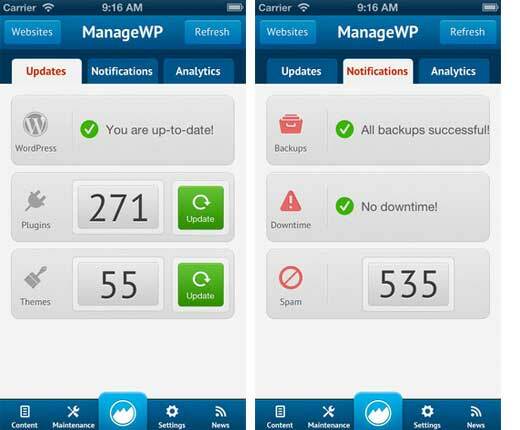 ManageWP is a tool that allows you to easily manage multiple WordPress sites efficiently. It is an ultimate dashboard that lets you control all of your sites from a single location. You can easily upgrade all of your WordPress sites with one click. You can see which plugins on which sites need to be updated, and update all of them without ever logging into to the site. 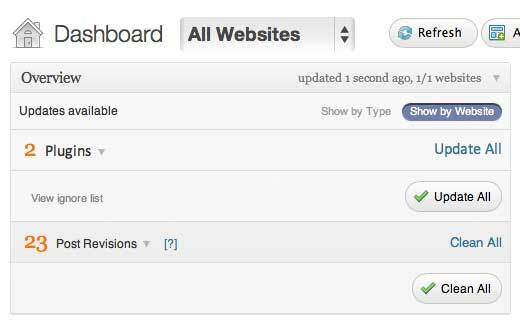 You can publish posts to your sites from a single dashboard rather than individually logging into them. It also allows you to moderate comments across your site from a single dashboard (which a lot of bloggers would love). You are probably thinking, that this much power on a single dashboard can be a high security risk. Well, it is not because the team at ManageWP have made security their #1 priority. All data is encrypted to the highest security standards. They have also integrated with Sucuri (same service that we use) to monitor all sites for security risks. Last but not least, they have two-factor authentication which only allows someone to login if they have your phone and your password at the same time. Before you start, we want you to know that ManageWP offers a free 30 days trial with all the features. After that you can either purchase a subscription or continue to use their basic package (for up to five sites) completely free of charge. First thing you need to is signup with ManageWP by clicking on the Get Started button. No payment information is required. Once you have signed up, lets go ahead and add your first website to your new ManageWP account. There are a few extra options available to you but let’s not worry about them for the time being. As you are adding your new site, you will be prompted to install the ManageWP worker plugin which will sit on your site and communicate with your ManageWP account. You will be taken to your site’s WordPress dashboard in order to install and activate the worker plugin. Once you have installed and activated the plugin just click back to your ManageWP account and hit “Add Site” again. Your new ManageWP account is now officially up and running. 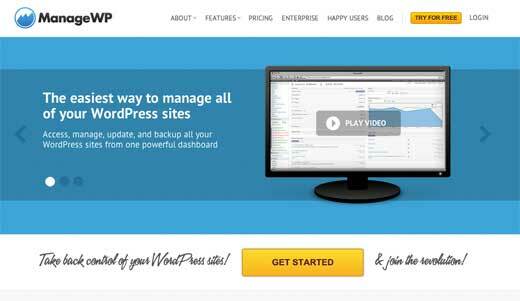 From this point on, you can go in and do everything like you would on your WordPress dashboard. The user interface for ManageWP is very intuitive and easy to work with. We will go through and briefly mention all the features that we like in ManageWP. ManageWP has a lot of features that it offers, and there is not enough room in the article for us to cover all of them. We will only mention some of our favorite features. There are probably a lot of same plugins that you use on every single WordPress installation. We know that we use a lot of the same plugins such as SEO by Yoast and Gravity Forms and various others. These plugins are very popular, and when it updates on one site, we have to login to each site and update them manually. Just hit the “Update All” button and ManageWP takes care of the rest! You can also update items selectively if you want to. Free solutions are typically only available site by site, which is a real pain when it comes to managing your backups and making sure that everything is in order. Standalone premium solutions typically cost an arm and a leg. 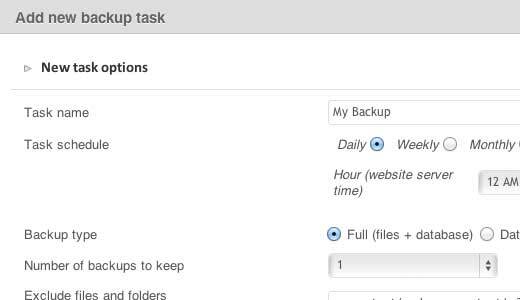 You can also integrate other backup destinations such as Dropbox and Google Drive. Just follow the onscreen instructions. Fair notice: we are using VaultPress to handle our backups. Everyone we talk with is always trying to optimize their site for SEO. Yes, we are guilty of that as well. Google and other search engines provide an opportunity that one would be foolish to ignore (see how we increased our organic search traffic). With that in mind, keeping track of your analytics, ranking data, and other SEO data can be a real pain. ManageWP makes it easy for you to see everything on one screen. You can hook up your Google Analytics account with ManageWP by granting access via the Settings screen. 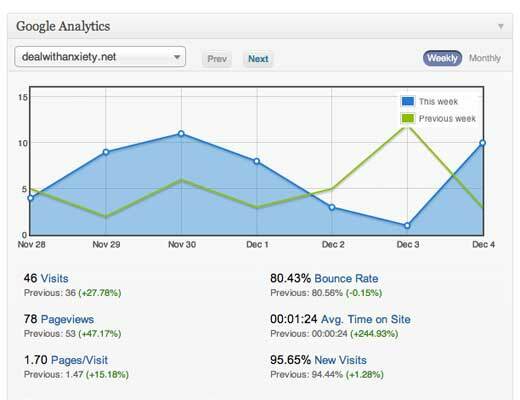 Follow the simple two-click process and you can access Google Analytics data directly from your ManageWP dashboard. You can also access rank tracking data by clicking on “SEO” in the sidebar. Select the sites and the keywords that you want to track, and ManageWP will figure out which keywords apply to which sites automatically. Those keywords will then be added to the tracking queue. You’ll also notice a huge selection of SEO data available to you, such as PageRank, Alexa rank, and so on. Almost all of the features mentioned above are available to you via the iOS app. They also utilize push notifications so that you can be instantly alerted of website downtime and traffic spikes. Above we have given you a sneak peek at just a few of the things that are possible with ManageWP which allows you to efficiently manage multiple WordPress sites. We didn’t cover bunch of other features that they have such as site cloning, code snippets, bulk user management, etc. ManageWP is totally free to try for 30 days, and totally free to use for up to five sites thereafter. If you have more than one website, just the free feature is good enough to handle the basics (such as updates). It is a huge time saver, and you can easily save yourself a few hours every month. Just head on over to the ManageWP site and get started now! And if you have any questions, please don’t hesitate to ask. Does this allow you to manage self-hosted websites ie Websites that have not been hosted? If yes, how do you go about that? It would depend on what you mean by self-hosted sites that have not been hosted, if you reach out to ManageWP with how those sites are set up they should be able to let you know the options available. I have used ManageWP for some time now with 5 websites and it is mostly an awesome experience. I haven’t used the backup part, so I would like to here your opinion about the quality and security of that. How is it compared to Backup Buddy? Is the restore and cloning process as good as Backup Buddy? If it is then there should be no reason to buy a license to Backup Buddy or do I then miss something? But that is NOT the way ManageWP does it! ManageWP just upgrade and/or update like if you used the 1-click solution on the update page in your admin section. Is that not a problem? We use and recommend VaultPress (if you want a hassle-free backup solution). It does everything for you and stores the data in cloud. 1-click restores have saved us in the past a few times. As for the upgrade process, you can surely follow all those steps. However it’s not feasible at all times. So most folks just upgrade using the 1-click upgrade button. In majority of the cases, it should not break anything. If you have VaultPress already, then you can restore from backup. Think you for the answer. I know that you ude and recommend Vault for backup, but I find it a little bit expensive for my budget. That’s why I asked for your opinion about BackupBuddy vs the backup part in ManageWp. Which one is best? Could you explain in some more words how Backup Buddy is more comprehensive? I can’t see they differ much in features, so is it the way of of doing the backups or is Backup Buddy more secure? I simply ask because I can’t figure if it is best to buy both products or if I can live with the build in backup in ManageWP. I just put a note to myself to explore this product further. Sounds very useful for someone like me that often gets overwhelmed with these types of tasks! I’m looking at a few things at the moment for my own and client websites. I want to be able to manage them and I want security. I’ve been looking at ManageWP and Sucuri, but can’t really afford both. Any suggestions on using the combination? Sucuri and ManageWP offers two separate services. ManageWP bundles a part of Sucuri service with their service, but it is not comprehensive. Do you need both? It is up to you to determine. Do you want the convenience of ManageWP? Then yes. If I have to pick one or the other, I’ll pick Sucuri because I feel it is more important. ManageWP is more for convenience. You are of course right, security is more important than convenience. Once I’m organised, I’ll go with Sucuri via your link. Is MangeWP also work in managing WPMU (network/multisite) installations? Yes it is compatible with Multisite. There is another one out there that I’ve found called http://infinitewp.com/ It does take a bit more I think, but it’s free. So far I’ve liked it! Yes, InfiniteWP is free but requires you to set it up on your own server. 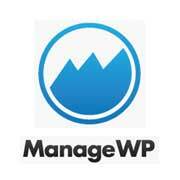 ManageWP is also free for a limited number of sites. InfiniteWP has no limits. We are planning on doing a side by side comparison between the two. WOW!! This tool looks like it will be super handy for my business!! Thanks for the article.